Google released a new updated interface for the iPhone and iPod Touch that lets Google Apps users easily access everything they need in an integrated environment: Google Calendar, Google Docs, Reader as well as Google Apps like Google Notebook, Google News and Blogger. 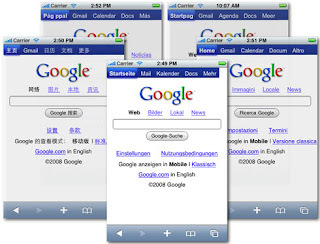 Google also announced that it is now available in several languages. They also implemented search query suggestions, and email auto complete. If you have Google Apps for your domain, you can bookmark or set http://www.google.com/m/a/your-domain.com as your default page for quicker access to the information you find the most useful. This specific functionality is new, but the interface you will be using is actually a few months old.